Latigo Smith is a gambler who desperately wants to not marry Goldie, a wealthy woman who’s got her eye set on him. After ducking out of a train in an attempt to escape her, Latigo finds himself in a mining town with two groups of miners obsessed with finding a large treasure of gold, rumored to be buried nearby. After Latigo loses a large sum of money at gambling, he concocts a scheme to pose his friend Jug as a well-known gunslinger named Swifty. Latigo hopes that the two rival groups of miners will pay this fake Swifty to get rid of each other, earning enough money for Latigo to pay off his debts. Things are complicated however when Latigo falls for the daughter of one of the head miners. After Latigo sides with her father, a rival miner sends for the real Swifty, and he's not happy to hear that someone's been impersonating him. 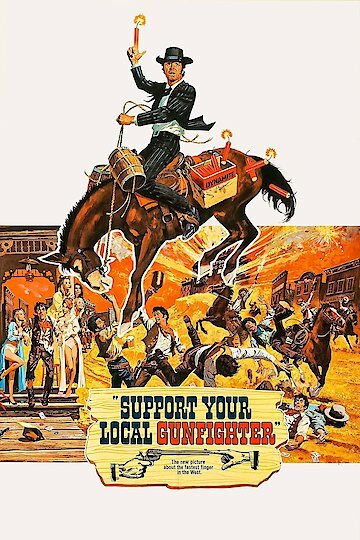 Support Your Local Gunfighter is currently available to watch and stream, download, buy on demand at Amazon Prime, Amazon, Vudu, Google Play, iTunes, YouTube VOD online.